Ten Mile Lake Provincial Park offers volunteer host opportunities. A 2 km nature trail to a large beaver pond, through forest and along an abandoned rail road is very rewarding to hike. In the winter the park’s trails are transformed into approximately 10 km of cross country ski trails. Approximately 12 km north of Quesnel on Highway #97. 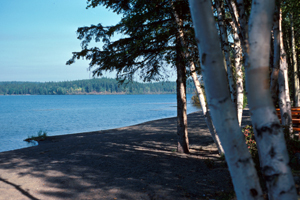 History: Ten Mile Lake Park was established in 1962 as a recreational destination for residents of Quesnel, as well as travellers on the Cariboo Highway. The name of the park comes from the milepost on the Pacific Great Eastern Railway that stood here in the early 1900s. There is still evidence of the abandoned rail grade in the park; the tracks had to be relocated because of difficulties in crossing the Cottonwood River north of the park. Cultural Heritage: The city of Quesnel was established as a supply centre during the Cariboo Gold Rush of the 1860s. It was originally much smaller than nearby Barkerville, which is now preserved as a Historic Town. Conservation: Ten Mile Lake Provincial Park is situated within the Fraser Basin, an irregular shaped depression of gently rolling hills and shallow lakes covering much of North Central B.C. The park lies in a transition area between the wetter Quesnel Highlands to the east, and the dry Chilcotin Plateau to the west, leading to a wide diversity of plant species. You can find white spruce, Douglas-fir, trembling aspen and lodgepole pine, while the forest floor is home to shrubs like red osier dogwood and saskatoon. Flowers, trees and shrubs are part of the park’s natural heritage, please don’t damage or remove them. Wildlife: Walk the Beaver Pond trail and view a beaver lodge and series of beaver dams. Ducks Unlimited has placed waterfowl nesting boxes and platforms around the beaver pond. Canoeing and kayaking can be enjoyed at this park. There is approximately 10 km of hiking trails with regulations for bikers. Hikers have right-of-way. Bicycles must keep to roadways and trails. Helmets are mandatory in British Columbia. Easy access to lake, fishing via boat. Shore casting possible. The best time to fish for the rainbow found in the lake is either in early spring or most evenings throughout the summer. There are ice fishing opportunities in this park. Anyone fishing or angling in British Columbia must have an appropriate licence. Ten kilometres of hiking trails are a popular way for the whole family to enjoy the park. Many of these trails double as cross-country ski trails during the winter. A self-guiding nature trail begins in the day-use parking lot opposite the picnic shelter. View a beaver lodge and a series of beaver dams. Note the nest boxes and platforms around the pond built by Ducks Unlimited. There are no lifeguards on duty at provincial parks. There are three long sandy beaches with two buoyed off swim areas. People can enjoy waterskiing on this lake. There is no maximum boat motor size. There are approximately 10 km of cross-country ski trails set in the winter. There are also snowshoeing opportunities at this park and the lake freezes over in the winter allowing for ice skating. The road into the park is ploughed to the first parking lot. There are ice fishing opportunities in this park. Anyone fishing or angling in British Columbia must have an appropriate licence. A concrete, single-wide boat launching ramp is located beside the Lakeside campground entrance. There is also a parking area for vehicles and boat trailers. This park has a day-use/picnic area. Picnic tables, fire pits, pit toilets, a covered shelter, three long sandy beaches and change-houses are all located at the day-use area. There are also picnic tables and a wood stove in the shelter. Firewood is not provided in the day-use area so people need to bring their own. Group picnicking is open from May 15 to September 30 and reservations are available for the picnic shelter. Pit toilets are located throughout the park. Flush toilets are located at the Lakeside Campground. An adventure playground, large grassy area and horseshoe pits are found in the day-use area. A sani-station/dump is available during the collecting season and is located near the entrance of the park. There are hot showers at the Lakeside campground. The showers are coin operated and cost one looney ($1.00) for approximately 4 minutes. This park offers vehicle accessible campsites. There are two large campground areas in the park, known as Lakeside and Touring. Campsite reservations are accepted at the Lakeside Campground and first-come, first-served sites are also available. The Lakeside campground consists of 60 sites, 6 of which are double sites. The Touring campground consists of 46 sites. There are a variety of shaded, treed, and open sites and extra parking available at each campground. The gate to the park is locked between 11:00pm and 7:00am. Only registered campers are allowed in the campground after 11:00pm and quiet time is between 10:00pm and 7:00am. Touring Campground (Sites 1 - 46). Full season. A minimum of 4 consecutive weeks must be booked. Please contact the Park Operator for information and to book one of these sites. Some facilities and hiking trails in the park are wheelchair accessible. There is paved access to the flush toilet buildings and showers at the Lakeside Campground and gravel access to the picnic shelter in the day-use area.